By the fall of 1943, the structure of wartime administration had assumed virtually its final form. On the domestic front, the War Production Board had refined its techniques for allocating scarce materials and guiding the flow of components. The challenge to the general form of organization of war activities by the proponents of the czar system of commodity organization had been met. The progress of military operations furnished additional stimulus to efforts to refurnish the organization for the conduct of foreign economic affairs, and responsibility for these matters had been concentrated in the Foreign Economic Administration. In addition, the superstructure of war organization had been rounded out by the creation of the Office of War Mobilization to aid the President in coordinating the activities of the various war agencies. reducing future production schedules and placing the work elsewhere. A general scarcity of labor had been predicted by many people since early in 1942. Yet when it actually came to be, no operating procedures were in effect to meet it. This failure was due partly to the large number of agencies involved in the problem. The pattern of demand for labor was determined largely by the actions of the numerous procurement services, while a considerable part of the labor supply was provided as an incidental effect of WPB limitation orders prohibiting or placing ceilings on production for civilian use. Thus, the most important actions influencing the use of manpower were not under the control of the War Manpower Commission, and its efforts to influence production and procurement policies were not markedly successful. The slowness of the emergence of labor shortages, however, was probably the greatest preventive of comprehensive and timely action. Steps which, if taken during 1941 and 1942, would have reduced the scarcity of labor in later years, were not taken because labor shortages had not yet appeared. Thus it was not possible in 1941 and 1942 to get serious consideration of national service legislation, use of occupation rather than dependency status as the major criterion in selective service policy, or placement of procurement contracts and new production facilities in areas of relatively plentiful labor supply.1 But by the time labor shortages actually became important, it was difficult to get action in these directions because of a widespread feeling that the most critical phase of the war was past and because administrative policies and procedures had solidified into rather firm patterns. fell almost entirely on civilian consumption and did not interfere very much with military procurement. While this was the over-all picture, a rudimentary system for allocating labor supplies, involving local cooperation among WMC, WPB, and the procurement services, was developed in a number of areas where scarcity of labor was particularly pressing--notably on the Pacific coast. 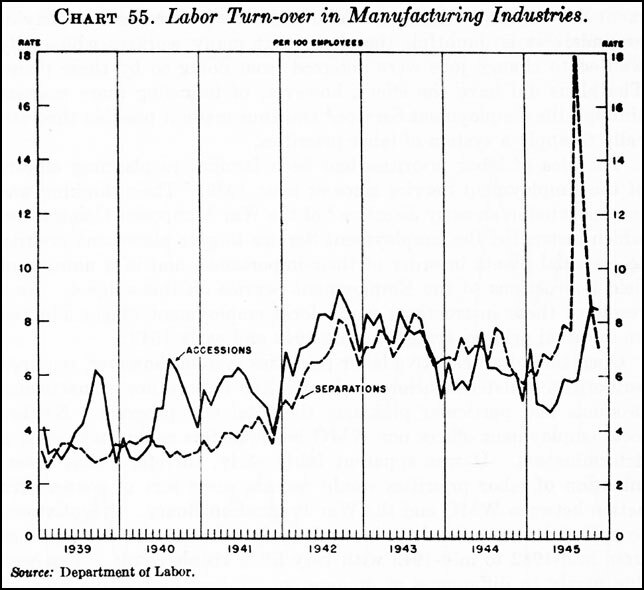 The labor controls established during the winter of 1943-44 were much looser than the controls over critical materials, but the machinery created at this time could probably have been tightened up to handle more critical labor shortages had they developed. Because of its potential significance, the mergence of this system will be traced in some detail. The period from the summer of 1940 to the summer of 1943 was one of large-scale manpower mobilization. The unemployed were put to work, some 7 million new workers entered the labor market, other millions transferred from peacetime to wartime jobs, and geographic movement of workers and their families assumed unprecedented proportions. This vast movement did not result to any important extent from direct solicitation by the Employment Service, the Civil Service Commission, or other Government recruiting agencies. it represented the response of millions of individuals to a variety of economic and noneconomic pressures. Movement of workers from nonwar to war jobs was stimulated by the much higher average earnings in war industries and, in the case of men 18 to 38, by Selective Service Pressures. New workers, primarily women, were attracted into the labor force by the east of securing jobs, high wage rates, the opening to women of many new job opportunities, and the disruption of family life due to military mobilization. levels,3 and had reached what both employers and Government agencies considered to be the maximum for efficient production. Nor could war production centers any longer rely on the strong inflow of workers from farms and small towns which had prevailed throughout 1941 and 1942. The Italian surrender and the progress of the Russian armies during the fall of 1943 caused many to anticipate a speedy conclusion of the war; a marked outflow of workers from war production centers set in. By late 1943, many cities were experiencing a net loss of labor. A stationary total labor supply meant a shrinking civilian labor force, for Selective Service inductions were still running at about 400,000 per month. At the same time, the demand of war industries for labor was increasing. Munitions production was rising at a rate of about 4 percent per month,4 and this called for some expansion of employment in war industries, though not nearly so large an expansion as was indicated by some current estimates.5 Turn-over also continued at a high rate. In September 1943, the monthly quit rate reached a peak of 6.29, while total separations were 8.16--a rate of almost 100 percent per year. The case of the Boeing plant in Seattle, which had employed 250,000 people since June 1940, but had only 39,000 employees in June 1943, was by no means unusual. Chart 51. 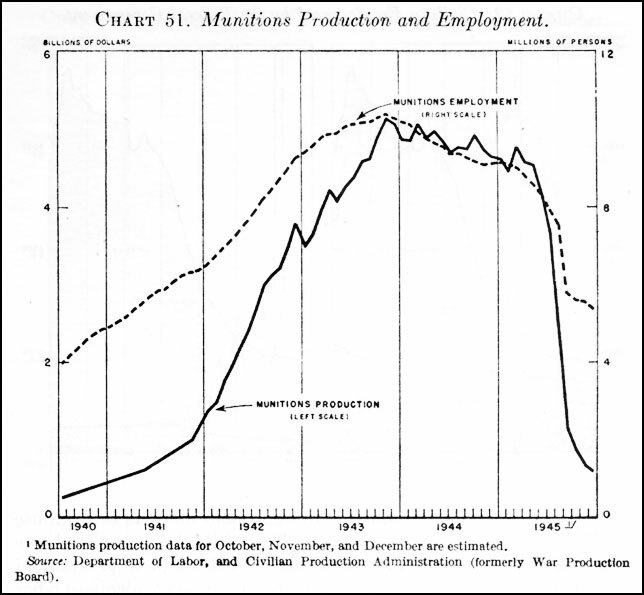 Munitions Production and Employment. not be increased, labor becoming available through turnover could at least be funneled into the local office of the United States Employment Service and directed, through a system of priorities or allocations, to the points of greatest need. Previous efforts to reduce the demand for labor in areas of shortage had met with only limited success. In October 1942, the War Production Board, by its Directive No. 2, instructed the procurement services to consider the adequacy of labor supply in particular areas as a factor in contract placement; this directive was amended and strengthened in the fall of 1943. The impact of this directive on actual procurement practice, however, was not large. Among the reasons were the traditional independence of the procurement services, preoccupation with price and delivery considerations, reluctance to give up customary sources of supply, reluctance to give up a facility which may then be taken over by a competing procurement branch, and the absence of any continuous policing by Army Service Forces headquarters of compliance by contracting officers with Directive 2. Chart 52. 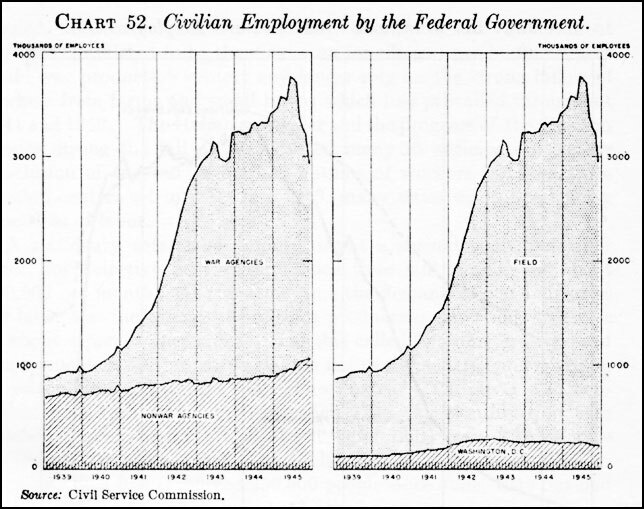 Civilian Employment by the Federal Government. Chart 53. Average Hours of Work in Manufacturing Industries. workers already in essential war work to stay on their jobs, and directing to war work any people coming voluntarily into the labor market from the home, from other areas, from nonwar work, or (since turnover of war workers could not be entirely prevented) from other war jobs. Chart 54. Non-Agricultural Placements by U.S. Employment Service. on December 10, 1942. As WMC appointed more and more area directors, employment stabilization plans were established in most of the important industrial areas of the country.7 IN addition to these area plans, the 12 regional directors had, by June 1943, established regional stabilization programs which--on paper, at least--covered all essential industries outside established manpower areas. Service for a certificate which might be granted on a variety of grounds. It is doubtful, therefore, that many workers who really wanted ot change jobs were deterred from doing so by these plans. The plans did have the effect, however, of funneling more workers through the Employment Service,8 and thus made it possible theoretically to apply a system of labor priorities. The idea of labor priorities had been familiar to planning officers of the Employment Service since at least 1939. Their thinking was incorporated in an early directive9 of the War Manpower Commission which instructed the Employment Service to give placement priority to essential plants in order of their importance, and in a number of field instructions to the Employment Service on this subject. As a result of these instructions many local employment offices adopted an informal priority system during 1942 and early 1943. Chart 55. Labor Turn-over in Manufacturing Industries. obtained from WPB could be applied. A system of labor priorities had necessarily to be applied on a local basis, and could not develop until WMC area operations were firmly established. A first step toward relating production programs and manpower requirements on a local basis was taken in June 1943, when Mrs. Anna Rosenberg, Director of WMC Region II, announced a revision of the Buffalo employment stabilization program. All male workers in the area were to be hired henceforth only through the Employment Service or other approved hiring channels. Although compliance with the program was voluntary, employers hiring outside the approved channels could be denied the facilities of the Employment Service. A labor priorities committee was created including representatives of WMC, WPB, and the procurement agencies. Taking into account the relative urgency of various end-products and the actual needs of individual plants for male workers, plants were placed on one of four lists: A priority, B priority, other essential plants, and other plants. All workers possessing the necessary skills were to be referred first to plants on the A priority list. The installation and initial success of this program led to intensified discussion at WMC headquarters of the possibility of extending labor priorities to other areas. In the meantime, a critical manpower situation had been developing on the Pacific coast. This region had undergone since 1940 a very great expansion of shipbuilding, aircraft and other production facilities, which were now striving to reach full production. Many military establishments requiring a large number of civilian maintenance and service workers had also been constructed on the coast. Immigration of workers from other states called for increased employment in trade, services, and other supporting activities, which, however, found it impossible to compete with the wage scales of war industries and tended instead to lose labor. Many war plant workers, dissatisfied with inadequate housing and community services, left their jobs after a short time. In the summer of 1943, the Pacific coast faced a situation in which labor demands were still being aggravated by placement of new contracts and facilities, turn-over was high and rising, there was heavy migration in both directions along the coast and from the coast to other areas, and no substantial reserves of labor existed.11 Although all of the industrial areas had employment stabilization plans, certificates of availability were being issued very freely by the Employment Service, and did not constitute an effective control over the movement of labor. and advise WMC of such determination, review proposals for any new supply contracts and facilities in the area which would require additional labor and recommend to WPB their approval or disapproval, develop programs for balancing labor supply and requirements by redistributing production from one area to another where necessary, and recommend to WPB any adjustments in civilian production necessary to bring labor requirements within the bounds of available supplies. In each area an Area Manpower Priorities Committee was to be established, with substantially the same membership as the APUC, but sitting under a chairman appointed by WMC. The Area Manpower Director, withe the advice of the Area Manpower Priorities Committee and using the information on production urgency provided by the APUC, was to list establishments according to the urgency of their need for labor, set employment ceilings for individual plants, and refer workers to jobs on the basis of these determinations. The procurement agencies were instructed ot present to the appropriate APUC for review any contract involving an increase in employment in the area, to give special consideration to the west coast in making production cut-backs, to redirect existing production from the west coast to other areas wherever feasible, and to encourage their contractors to subcontract as much work as possible to producers outside the west coast region. Selective Service was to give special consideration for deferment to workers in critical occupations in high priority establishments. Registrants qualified for critical occupation but not employed in high priority plants were to be referred to the Employment Service for placement in such plants. At the request of a plant management of WPB, WMC was to undertake studies of labor utilization in particular plants and make recommendations for better utilization of labor; it was to make full use, however, of the facilities and resources of all other Government agencies--which meant principally the procurement agencies. WPB and the procurement agencies were to cooperate in such surveys and to use their influence to secure the execution of approved recommendations. San Francisco, Portland and Seattle.12 Controlled referral was applied to all males in Los Angeles; to all males and all women in essential activity in Portland, San Francisco, and San Diego; and to all workers in Seattle.13 Production urgency lists, manpower priorities lists, and employment ceilings were established for each area, and workers were referred to jobs in accordance with these priorities. The Selective Service System also took immediate steps, noted more fully below, to postpone the induction of necessary workers in west coast aircraft plants. to do this and, with the exception of occasional flagrant cases, did not do it. Their activity was primarily directed to insisting that WMC meet at once the alleged manpower needs of any contractor. Their position, in other words, was that WMC was purely a labor recruiting and supplying agency which must accept at face value the labor requirements stated by employers. The labor utilization section of the west coast program was another attempt by WMC to circumvent this attitude of the procurement agencies, and was no more successful than earlier efforts had been. WMC utilization consultants were not able even to gain admission to west coast plants working for the Maritime Commission and the Army Air Forces--and this included the largest plants in the region--and did not have much better success elsewhere. The provisions of the west coast program which called for adjustment of labor requirements to available supplies on an area basis also proved to have little effect. Procurement agencies were required to submit to the Area Production urgency Committee for review only those contracts which in their judgment, i.e., usually in the judgment of the contractor himself, would require the employment of additional labor. Even when contracts were presented for review, powerful community pressures worked against disapproval, and the volume of disapprovals recommended by area production urgency committees was negligible. The plan established no control over the letting of subcontracts to west coast firms. It did instruct the procurement agencies to induce prime contractors in the region to subcontract more work outside the region; whether any important results were achieved in this direction cannot be determined from the available data. WPB took no action on the section of the program which authorized curtailment of less essential activities in order to release labor for war work. Action on this front would have been highly unpopular on the west coast. Yet so long as it was not taken, the procurement agencies were in an impregnable position in contending that their own activities should not be curtailed. Data on over-all labor requirements and supplies were so unsatisfactory that it was impossible to convince a procurement official that programs in which he was interested could not be carried out. In the absence of any genuine control over either aggregate labor demands or supplies, in the absence even of any reliable estimates on these matters, the "balancing of the labor budget" on an area basis which Baruch had recommended was bound to remain an unrealized objective. again to about the level at which it had been before the plan was announced. There was indeed no reason to expect a reduction of turn-over; the only restriction on quits was the certificate of availability, and certificates continued to be dispensed as readily after the plan was established as before. In November 1943, the percentage of requests for statements of availability which were denied was 4.6 in San Diego, 2.3 in San Francisco Bay, 8.3 in Los Angeles. These percentages were roughly the same as in September. The program did, however, have at least four significant results. First, it eased the labor recruitment problem of high-priority plants by exposing a larger number of workers to jobs in these plants. Controlled referral channeled larger proportion of the manpower flow through the Employment Service, and the priority system directed this flow to the points of greatest estimated need. Second, the process of setting employment ceilings appears to have called forth a more realistic appraisal of labor requirements from employers and procurement officials. The apparent "tightness" of labor markets on the west coast, as elsewhere, was partly a statistical illusion resulting from highly inflated requirements and correspondingly alarming labor "deficits." When the fact of limited total supplies was impressed on everyone by an allocation procedure, some of these stated requirements were drastically reduced. The possibility that contracts might be withdrawn was also an inducement to employees to reduce the "tightness" of the area by cutting their requirements. Third, adoption of the west coast program caused procurement officials in Washington to give increased attention to labor supply in placing contracts. While work already under way was not removed from the coast, a good deal of future work was canceled and many contracts which would otherwise have been crammed into the area were placed elsewhere. This did not effect a systematic balancing of labor supplies and requirements in each area but it did ease pressure on the west coast as a whole, and was doubtless the most important effect of the program. was not present. Had the manpower situation become really alarming during 1944, it would have been possible, by tightening up the machinery and enforcing the controls provided in the west coast program, to achieve additional improvements in the use of manpower. Certain features of the west coast program were adopted in many other critical areas during the winter of 1943-44. This was done largely at the instance of State and area WMC directors. Because of the strength of management-labor opposition to "compulsion," which varied form area to area, WMC headquarters considered it unwise to order the establishment of any uniform pattern of controls throughout the country. Area directors, however, were often willing to add new controls after some other areas had tried it and "gotten away with it." 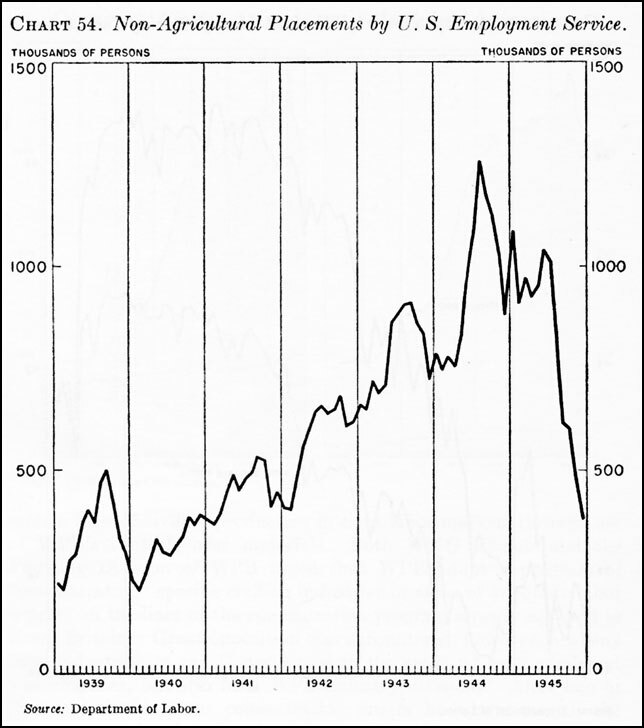 Employment stabilization plans had spread in this way during the first half of 1943. Once the west coast program had demonstrated its ability to survive, certain of its provisions also tended to spread "on the grapevine" to other areas. By May 15, 1944, ten areas outside the west coast had the full equipment of manpower priorities, employment ceilings, and controlled referral.15 While the results of these programs have not been appraised, the comments made above on the results of the west coast plan would probably be applicable rather generally. On June 1, 1944, WMC instructed its regional directors to take action by July 1 to establish manpower priorities committees and controlled referral of male workers in all manpower areas, and employment ceilings in all shortage (group ( and II) areas. This action rounded out a substantially uniform national pattern of manpower control on the lines of the west coast program. Only two additional "gadgets" were added to the program during the war: (1) In some areas especially critical plants were manned by limiting all referrals to them for a certain period; in other areas, however, employment service interviewers were merely instructed to "sell" jobs in high priority plants and exclusive referral was not used. (2) Beginning in January 1945, an effort was made to compel limited numbers of workers to transfer to essential work by reducing employment ceilings in less essential plants. steps in the direction of over-all manpower allocation. Progress in this direction was reversed, however, when Congress intervened, first to secure special Selective Service consideration for farmers, second to secure special consideration for fathers, and third--in December 1943--to remove the Selective Service System from the War Manpower Commission. The selection of men for military service was never part of a long-range and comprehensive manpower program. It was done by some 6,500 autonomous local boards, somewhat influenced by shifting policies hammered out at national headquarters under the immediate pressure of next month's draft call. From 1940 until February 1943, more than 80 percent of the men inducted into the armed forces were single men under 30.16 By the spring of 1943, however, the supply of such men was virtually exhausted. Draft calls were still running at a rate of about 400,000 per month. These calls could be met only by drafting men hitherto deferred because of their occupation or their dependency status. But which group should be called first? Should occupation of dependency constitute the primary basis of deferment? Should fathers be drafted while men without dependents remained deferred on occupational grounds? The Selective Service System's freedom of choice in this respect had been somewhat limited in November 1942 by a Congressional requirement that agricultural workers be given special consideration for occupational deferment. Section 4 (K) of Public Law 772 (77th Cong., 2d sess., ch. 638, H.R. 7528)--the so-called "Tydings amendment"--required that local boards defer any worker "necessary to and regularly engaged in an agricultural occupation or endeavor essential to the war effort . . . so long as he remains so engaged and until such time as a satisfactory replacement can be obtained." While this simply repeated language already contained in Selective Service instructions to local boards on occupational deferment, it was a clear expression of congressional intent that farm workers be given special treatment and they were in fact given virtually a blanket exemption from this time on. By September 1, 1943, some 2,095,788 agricultural workers had been given occupational deferment, compared with 1,527,382 in all other industries. Agricultural deferments amounted to 47 percent of the number of men aged 18 to 44 who were in the agricultural labor force in 1940. Occupational deferments of other workers at this time amounted to only 7 percent of the 1940 male labor force aged 18 to 44.
wished to eliminate the dependency criterion as rapidly as possible and to base deferment primarily on the individual's productive contribution. Selective Service officials, on the other hand, were skeptical of alleged occupational indispensability, and were inclined to delay the drafting of men with dependents even if this meant cutting heavily into the occupationally deferred group. This feeling was particularly strong in the local boards, some of whom refused to draft fathers even after they had been instructed to do so by Selective Service headquarters. Whatever the merits of the matter, the Selective Service viewpoint was probably a more accurate reflection of congressional and public opinion than the WMC position. A convenient way out of the difficulty might have been found if all men with dependents could have been induced to take necessary jobs in essential activities and then deferred on that ground. A step in this direction was taken on February 1, 1943, when the Selective Service System issued a list of "nondeferrable occupations." Local boards were instructed that men of draft age who did not leave these occupation--which were largely in the luxury manufacturing and service industries--by April 1 were to be classified as available for induction regardless of dependency status. The intention was to add occupations to this list form time to time and thus force more and more men with dependents into essential work. Because of the strong congressional criticism evoked by the order and for other reasons, however, this was never done. This order was a major factor in the introduction by Senator Wheeler of the "father draft bill"--S. 763, Seventh-eighth Congress, introduced February 25, 1943--which would have exempted men with dependent children from induction regardless of their occupation. The order was rescinded on December 5, 1943, after passage by Congress of a revised version of the Wheeler bill, which is discussed below. Hershey announced that about 500,000 fathers would have to be inducted between October 1 and January 1. As matters actually developed, however, only about 100,000 fathers were inducted during this period. Despite headquarters instructions, the local boards avoided drafting fathers by inducting the occupationally deferred at a much more rapid rate and by underfilling their quotas by about 30 percent during these months. This attitude was perhaps not unconnected with the fact that Congress began consideration of the Wheeler "father draft bill" on September 15; many boards hoped that if they held back on inductions of fathers and if the Wheeler bill passed they might never have to take this unpleasant step. As finally enacted17 buy Congress on December 5, the Wheeler bill provided merely that fathers should be called after all available nonfathers, which was substantially what Selective Service was already trying to do. The act also contained a provision which reestablished the Selective Service System as an independent organization outside the War Manpower Commission.18 The transfer of Selective Service to WMC in December 1942 had actually had very little effect on Selective Service operations. It had, however, displeased Selective Service officials and they were glad of an opportunity to secure a reversal of the President's decision from a Congress critical of WMC and easily disposed to blame it for the father draft problem. Service directors with instructions to order such a review in their States. This step completed a trend which had been evident for several months toward selection of men for military service on an age basis. On January 6, 1944, local boards had been instructed not to grant occupational deferments to men 18 to 21 except on certification by the State director.20 This intensive scrutiny of occupational deferments was now extended to men 22 to 25. Selection policy had shifted definitely toward emphasis on age categories, 18 to 21, 22 to 25, 26 to 29, 30 to 33, 34 to 37--with the occupational deferment policy becoming progressively more liberal as one proceeded up the age scale. This was to remain the basic approach of Selective Service for the remainder of the war. It was obviously necessary that the agencies involved hold their requests for deferments within limits and that machinery be set up to establish a quota of deferments for each agency. The military agencies contended that this should be handled by the Production Executive Committee of WPB, on which they were heavily represented. Mr. McNutt, however, developed a plan for a new interagency committee under WMC auspices and secured a favorable vote on it in the Commission. In the end, this plan was adopted, an interagency committee on occupational deferments was created in late March with Mr. McNutt as chairman, and agency quotas were set up totaling 40 thousand. The function of this committee, however, was merely to present recommendations to the Director of Selective Service, who retained the right to designate the establishment which would be permitted to operate under the plan. The shift of Selective Service to an age basis was due to the demand of the armed services in 1944 for young men and to community pressure for drafting of occupationally deferred single men before fathers. Under the new policy, occupational deferment for men under 26 ceased to exist except for a limited number of men whose irreplaceability was certified by the employer, the responsible procurement agency, and the State Director of Selective Service. When the continuation of the war into 1945 forced a combing out of men aged 26 to 29,23 the existing interagency committee established new deferment quotas for this group. The great majority of men over 30 continued for the remainder of the war in deferred classes--nominally on the basis of occupational essentiality, rather liberally interpreted, but actually on the basis of age and family status. The Selective Service System nevertheless followed a policy of "keeping the heat on" these men in various ways to ensure that as many as possible of them would remain in essential work. his job without prior consent of his local board might be reclassified into a class immediately available for service. The War Manpower Commission opposed this order during discussions conducted by the Director of OWMR, but finally agreed reluctantly when a clause was added providing that USES referral cards should be given "serious consideration" as evidence that a man was justified in leaving his previous job. As its part of the arrangement, the War Department agreed to accept "job-jumpers" for induction even if they did not meet Army physical standards. Through June 1945, some 70,000 men were given preinduction physical examinations and about 45,000 were inducted under this arrangement. The normal procedure with respect to these men was to put them in Army camps and then after a short time offer them a chance to return to their previous jobs as members of the enlisted reserve--an opportunity which few men declined. essential activities. Responsibility for registering, classifying, and selecting workers, and for directing them to stay on their present jobs or assigning them to new jobs, was vested in the Selective Service System. Appeals could be taken from decisions of local boards through the regular machinery of Selective Service. Hearings on the bill were begun in the Senate on January 12 and continued off and on until March 2.26 Testimony in support of the bill was presented by Secretary Stimson and Under Secretary Patterson of the War Department, Secretary Knox of the Navy Department, and Admiral Land of the Maritime Commission. The main arguments advanced for the bill were that it would reduce strikes and labor turn-over, raise the morale of the armed forces, and impose equality of sacrifice on the entire population. Mr. McNutt publicly announced his support of the President's request for a national service law; but the Austin-Wadsworth bill which gave administrative responsibility of the Selective Service System was disliked by WMC and no one form the Commission testified on it. William Green expressed the opposition of the AFL to the measure, and it was well known that other labor and management groups held similar views. The committee was obviously reluctant to proceed in the face of this opposition, and the bill was never reported. After the Austin-Wadsworth bill bogged down, consideration was given to a more limited measure which would have empowered local Selective Service boards to assign IV-F's to essential work under penalty of induction into Army labor units.27 This proposal was supported by the War Department, the Navy Department, and the Selective Service System, and was even given general approval by the War Production Board. The War Manpower Commission, industry, and labor opposed it. The fact that nothing came of the proposal was due partly to a sudden easing of the draft situation. In early April, the Army discovered that it had erred to the extent of several hundred thousand men in its figures of Army strength, and that it was already beyond the strength authorized for July 1. As a result of this, draft calls for subsequent months were considerably reduced and pressure for legislation subsided. voluntary compliance by employers and workers, supplemented by such influence as contracting officers chose to exert over the personnel practices of their contractors. A comprehensive national service system supported by penal sanctions, which might possibly have been enacted immediately after Pearl Harbor, failed of Congressional acceptance after that time.28 Leaders of labor and management were sincerely convinced that national service meant "regimentation" and "forced labor," and steps to dispel their impression were not taken early enough to be successful. Congress was extremely reluctant to touch legislation opposed unanimously by labor, industry, and agriculture. High officials of the Administration were aligned against each other in shifting combinations on the question whether national service legislation should be passed and whether, if passed, it should be administered by WMC or Selective Service. Perhaps most important, however, was the fact noted above that labor shortages never retarded production sufficiently to compel action. the very great labor reserves with which the United States entered the defense period enabled the country to mount a very large military and production effort without an effective manpower program. If the Nation had been called on for a maximum effort--if the war had been longer, military casualties heavier, the production program larger--the absence of a tight manpower program would have had most serious consequences. After the spring of 1944, labor shortages were not a major problem, though anxiety on this score was revived for a short time by the German counteroffensive of December 1944. Military contracts, which had been cut back considerably during the summer and fall of 1944 when the end of the European war appeared imminent, were sharply increased after the counteroffensive began. Many plants which had laid off workers were faced with a difficult problem of rebuilding their labor force. At the same time, an atmosphere of crisis was created by statements of military officials that the troops at the front were short of ammunition and supplies, that production programs were lagging, and that labor shortages constituted the most serious production problem. support of OWMR, the President included in his message on the state of the union (Jan. 6, 1945) a request for the passage of a national service act.29 Pending action on such an act, the President recommended "that the Congress immediately enact legislation which will be effective in using the services of the 4,000,000 men now classified as IV-F in whatever capacity is best for the war effort." On the same day Representative May introduced a bill, H.R. 1752, which provided for "freezing' in their jobs of all draft registrants already engaged in essential work, and assignment of other draft registrants--principally IV-F's--to essential work through the Selective Service System. This bill strongly resembled proposals advanced in 1944 by Colonel Keesling of Selective Service and Mr. Patterson, the Under Secretary of War. The original draft of the bill provided that violators should be inducted into a special work corps under military supervision and at Army rates of pay. After testimony by the War Department that this provision might be burdensome to them, this clause was replaced by the regular criminal penlites of the Selective Service Act. In hearings before the House MIlitary Affairs Committee, H.R. 1752 was supported by the Selective Service System, the War and navy Departments, the War Production Board, and the Farm Bureau Federation. Representatives of the AFL, CIO, railroad unions, Chamber of Commerce, and National Association of Manufacturers opposed the bill. The Deputy Chairman of the War Manpower Commission, testifying in the absence of the Chairman, made his lack of enthusiasm for the bill reasonably clear despite the limitations imposed on him by the official Administration position. The bill was reported favorably by the Committee on January 24 and was passed by the House on February 1 with only brief discussion. passage of the May bill. This was the first occasion on which the major labor and management groups had supported any legislative proposal in this field. The bill reported by the Senate committee on February 22 was substantially the WMC substitute bill. It authorized continuation of existing WMC hiring regulations under the general supervision of OWMR; penlites were imposed on employers for violation of these regulations, but there was no provision for penalties on employees. It thus differed radically in conception from the bill passed by the house, which was essentially a "labor draft" law apply to men of military age. The bill reported by the Senate committee was passed by the Senate and the two bills sent to conference. The bill recommended by the conference committee on March 26 was in general the Senate bill with the addition of provisions for "freezing" labor in designated areas or activities and imposing penlites on workers who violated such orders. This bill was considered by supporters of the May bill to be too weak to meet the problem. The conference report was rejected by the House and the bill sent back to conference, where it remained until the rapidly approaching end of the European war removed the pressure for action. Had the war lasted another 3 months, legislation along the general lines of the Senate bill would probably have passed. including some guarantee to the transferred workers of reemployment in their previous jobs. As the end of the European war approached, production schedules were once more reduced. Complaints of unemployment were heard for the first time in 3 years. The question of how men laid off from war jobs could most readily be reabsorbed into peacetime industry received increased attention. This was part of the larger problem of planning for the economic transition from war to peace, which came increasingly to the fore during 1945. 1. The statement that these things were not done does not necessarily constitute a judgment that they should have been done. Each involves considerations other than mere production efficiency. 2. U.S. War Manpower Commission, Manpower Statistics, May 1945, No. 18, pp. 1-4. 3. Average weekly hours in manufacturing increased from 37.3 in May 1940 to 45.3 in May 1943 (Manpower Statistics, Sept. 1943, p. 47). This represents a general increase from a scheduled work-week of 40 hours in 1940 to 48 hours in 1943. In shipbuilding and certain other war industries, however, a scheduled work-week of 60 hours or more was not uncommon at this time. 4. The War Production Board's index of total munitions production rose from 97 in June 1943 to 117 (which proved to be the peak) in November 1943. 5. It was estimated in July 1943 that employment in munitions and munitions materials industries would have to increase 1,700,000 by January 19844, to meet production programs (WMC, Manpower Statistics, September 1943, p. 1). 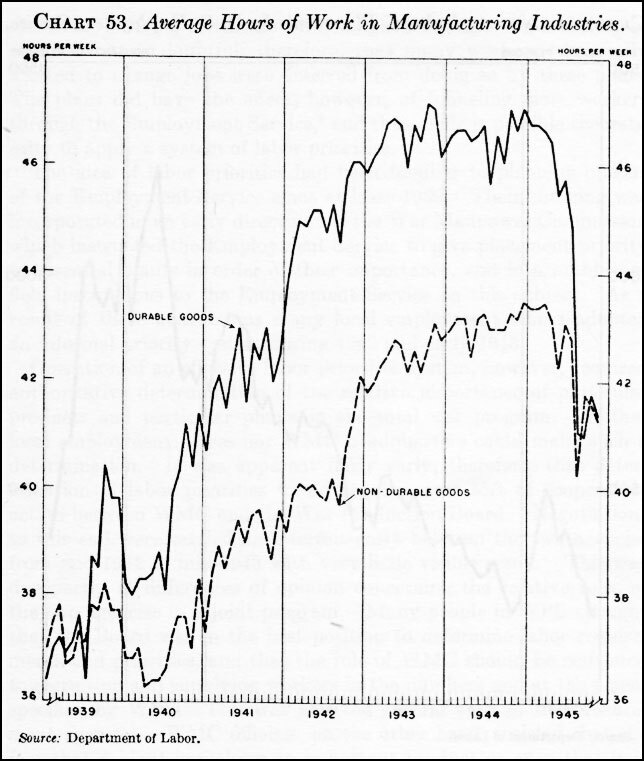 As matters actually developed, employment in munitions industries reached a peak in November which was only 300,000 above the July level, and employment in January 1944 was exactly the same as in July 1943. This discrepancy between forecast and event probably arose in part from contract cut-backs not foreseen in july, from increased output per manhour as hoarded labor was put to work and more efficient methods were developed, and from the consistent tendency of employers to overstate their labor requirements (on which WMC estimates were based). This frequent forecasting on the basis of imperfect statistics of an impending "manpower crisis" which later failed to develop was an important factor tending to discredit WMC in the eyes of WPB and the military. WMC cried "wolf" so often that other agencies were skeptical even when shortages actually appeared. 7. By March 15, 101 area directors had been appointed and 44 employment stabilization plans were in operation. 8. USES nonagricultural placements were 640,000 in August 1942, and 1,259,000 in August 1943. 9. War Manpower Commission Directive No. III, June 22, 1942, 7 Federal Register 4748. 10. Directive II of the War Manpower Commission, issued on June 22, 1942 (7 Federal Register 4748-9) instructed WPB to supply WMC with information on the relative importance of critical war products. Because of the difference of viewpoint just described, however, no action developed from this directive. 11. U.S. Congress. Senate. Committee on Mililtary Affairs. Labor shortages in the Pacific coast and Rocky Mountain States, 78th Cong., 1st sess., Hearings on S. Res. 88 and S. Res. 113, Sept. 9-10, 1943. 12. Although the plan was termed a "west coast" plan, it was in fact confined to these areas. Other parts of the three Pacific Coast States continued to be covered by the simpler employment stabilization programs. 13. "Controlled referral" did not mean exclusive hiring through the Employment Service; company personnel offices and trade-union offices were named as authorized hiring agencies in many cases. In San Diego, for example, 146 unions were authorized to act in this capacity. While spot checks indicated that authorized hiring agencies were operating in general accordance with priorities rules, the controls were inevitably looser than they would have been had hiring been completely centralized. 14. War Manpower Commission, Management-Labor Policy Committee, Minutes, Jan. 22, 23, 1943, pp. 7-11. 16. Most of the remainder were under 38. Men 38 through 44 were accepted for service until Dec. 5, 1942, but only a small percentage of the men in this age bracket were able to meet the physical standards of the services. 17. 57 Stat. 596 (Public Law No. 197). 18. Public Law No. 197 provided that the powers delegated to the President under the Selective Service Act could be delegated by him only to the Director of Selective Service. This was implemented by Executive Orders No. 9409 and 9410, Dec. 23, 1943, (8 Federal Register 17319) which respectively made the Director of Selective Service a member of WMC and delegated to him (rather than to the Chairman of WMC) the President's powers under the Selective Service Act. 19. U.S. Congress. House. Committee on military Affairs. Investigations of the National War Effort. Hearings before the Special Committee on Draft Deferment . . . 78th Cong., 2d sess., pursuant to H. Res. 30, March 15-31, 1944, p. 3. Of these 910,000 however, 562,400 were engaged in agriculture and were difficult to induct because of Congressional feeling that agriculture should be given special consideration. 20. Local Board Memorandum 115, Mar. 16, 1942, amended Jan. 6, 1944 (mimeo.). Two steps in this direction had been taken even earlier. On June 4, 1943, at the same time that local boards were instructed not to induct fathers before Oct. 1, the State directors were told informally that all men under 25 appearing on plant replacement schedules should be scheduled out during the next 6 months. On Sept. 1, 1943, the local boards were instructed to reexamine all occupational deferments of men 18 to 25 (Local Board Memorandum 115-B). These instructions were not compelling, however, as those issued in 1944. 21. In August 1942 the War Department requested that no men regularly engaged in aircraft production on the west coast should be inducted for a 6-months' period. On August 2 the Director of Selective Service authorized the State directors in Washington and California to postpone the induction of such registrants eve if they appeared on replacement schedules and even if their home boards were located outside these States. Between August 2 and September 4, some 1,045 men were given an emergency stay of induction. On Sept. 1, this authorization was extended for another 60 days. On Nov. 6 a permanent procedure was issued (Local Memorandum 115-E), under which individual requests for deferment could be certified by the procurement representative in the plant if he considered the worker involved was irreplaceable; on receipt of a certified request, the local board was directed to reopen the case and classify the registrant anew even if he had been mailed an order to report for induction. This procedure was subsequently extended to a number of plants not on the west coast which were making components for B-29 bombers (State Director Advice 254-A, Dec. 31, 1943). A special arrangement was also made with the War Shipping Administration for certification of merchant seamen (Local Board Memorandum 115-H, June 2, 1944, amended Oct. 28, 1944). 22. State Director Advice 255-C, 255-D, Mar. 3, 1944; 255-E, Apr. 1, 1944. Washington, D.C.: Government Printing Office, 1944. 23. Selective Service Regulations, Amendments No. 284 (10 Federal Register 2171-72) and No. 286 (10 Federal Register 2172-73). 24. S. 666 and H.R. 1742, 78th Cong., 1st sess., Feb. 8, 1943. 25. U.S. Congress. House. Committee on mililtary Affairs. Investigations of the National War Effort. Hearing before the Special Committee on Draft Deferment . . . 78th Cong., 2d sess., pursuant to H. Res. 30, March 15-31, 1944, p. 112. 26. U.S. Congress. Senate. Committee on Military Affairs. National War Service Bill. Hearings on . . . S. 666, 78th Cong., 2d sess., Jan. 12-Mar. 2, 1944. 27. U.S. Congress. House. Committee on Military Affairs. Investigations of the National War Effort. Hearings before the Special Committee on Draft Deferment . . . 78th Cong., 2d sess., pursuant to H. Res. 30, March 15-31, 1944. U.S. Congress. Senate. Committee on Military Affairs. Manpower for war production. Hearings . . . 78th Cong., 2d sess. on S. 1864, May 4-29, 1944. A number of earlier "IV-F bills" had been introduced in both houses from the summer of 1942 on. See, for example, H.R. 3566 and 4329, 78th Cong., introduced by Mrs. Luce; H.R. 5615, 78th Cong., introduced by Mr. Case; S. 1702, 78th Cong., introduced by Mr. Brewster. 28. Curiously enough, no comprehensive national service law in the British sense was ever presented to Congress for action. Drafts of such a law abounded in the War Manpower Commission, but the steadfast opposition of the Management-Labor Policy Committee prevented their presentation. The bills which were introduced in Congress, and which found support in Selective Service and the War and Navy Departments, were rather primitive "labor draft" laws to be administered by Selective Service and in some cases applying to only men of military age. These bills were abhorrent not only to labor and industry but to most Government officials experienced in dealing with labor matters. WMC, logically the proponent and administrator of national service, thus found itself in the position of opposing all legislation on the subject and of fighting continual rear-guard actions with the military agencies. 29. The ability of the military agencies to press for manpower legislation was strengthened at this time by the presence of General Clay (formerly head of the Army Service Forces' Production Division) as Deputy Director of OWMR, while the position of the War Manpower Commission was weakened by the absence of its Chairman on a European trip.